Shown here is a view of the interior of the dish. Shown here is a close up of the molded feet. 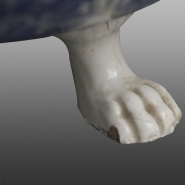 An earthenware cress drainer on three molded lion paw feet. 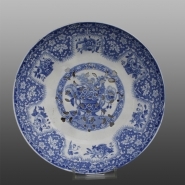 This dish would have sat in a saucer and would have drained cress prior to serving. Printed in blue in the Filigree pattern.